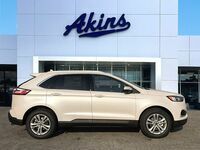 Ford is getting ready for a huge 2019 model year by unveiling the all-new 2019 Ford Edge lineup, which we have right here at Akins Ford near Atlanta, GA. In previous model years, the new Edge lineup has been somewhat overlooked thanks to Ford’s other impressive SUV offerings – like the EcoSport, Escape, Explorer and Expedition. But that’s not going to happen during the 2019 model year, as Ford has gone all out in making the all-new Edge lineup more powerful, more versatile, more efficient and more fun to drive than ever before. 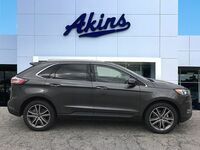 That means anyone looking to purchase a new Ford SUV at Akins Ford near Atlanta, GA, is going to want to check out the all-new 2019 Edge lineup. As great as the 2018 Edge lineup is, the 2019 Edge lineup is that much better. To show you what we mean, we decided to put together this 2019 Ford Edge versus 2018 Ford Edge head-to-head model comparison. 250 HP & 275 lb-ft. Standard Horsepower and Torque 245 HP & 275 lb-ft.
335 HP & 380 lb-ft. Max Horsepower and Torque 315 HP & 350 lb-ft.
As you can see in our comparison table, the 2019 Ford Edge lineup offers more trim levels to choose from than the 2018 Ford Edge lineup offered. There are, in fact, two all-new Edge trim levels for the 2019 model year, and these aren’t just two all-new Edge models with new names. Instead, they are both something truly special. One – the all-new 2019 Ford Edge ST – is the only SUV to ever be worked on by the Ford Performance Team. Because of the Ford Performance Team’s involvement, the 2019 Edge ST will feature the most powerful V6 engine in its class, offering up to 335 horsepower and 380 pound-feet of torque. Those ratings easily trump the power ratings offered by the 2018 Edge lineup. Speaking of power ratings, the 2019 Edge lineup offers five more standard horsepower than the 2018 Edge lineup offered, while the standard torque rating remains the same. The other new trim level is the all-new Ford Edge Titanium Elite, which is Ford’s most luxurious SUV to date, featuring a slew of all-new interior and exterior stylings and features. 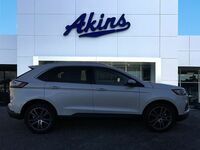 For more on the 2018 Ford Edge lineup or the 2019 Ford Edge lineup, please contact our friendly and knowledgeable staff here at Akins Ford near Atlanta, GA.